For the most part, Greg Smith has been the ideal backup center for the Houston Rockets. With his great hands and soft touch around the rim, Smith’s skill set is especially complementary to that of Omer Asik, a big, defensive-minded bruiser with limited offensive polish. Listed 6’10” 250, Smith brings legitimate size to the table, and he’s pretty athletic, too. He can be relied upon to come in for 15 minutes a game and finish approximately 65% of his shot attempts, which is about all you can ask for from a guy playing for the league’s minimum salary. The Rockets are fortunate to have him locked up through ’13/14. That said, Smith is still a work in progress. He won’t turn 22 for another few days, and with just 35 games of NBA experience under his belt young Gregory has much to learn yet. Last night, he tried to tie his shoe in the painted area, resulting in a three-second violation and a Rockets turnover. He also experienced the misfortune of airballing a free throw. 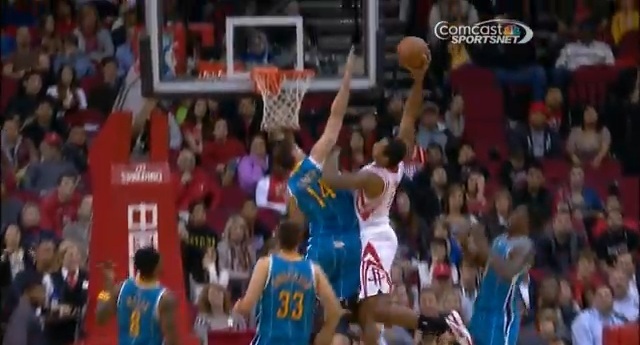 Embarrassing little errors, but nothing too detrimental to Houston’s cause (they beat New Orleans with ease). Plus he made up for all that by mashing on Jason Smith, no relation. Honorable mentions to Derrick Favors and Brook Lopez. It was a close call today, but I felt that Smith put a little extra mustard on his one-handed crush.